The former communist-block part of partitioned Germany, whose rulers called it the “German Democratic Republic,” can still be referred to by the name current both then and now, namely “East Germany.” It comprises the historical states of Brandenburg, Saxony, and Thuringen. Many Americans, I fear, are not aware that the historically German regions of Silesia, Pomerania, and East Prussia were simply stolen by the “allies” after WW2 and forked over to Poland and Russia; or rather, the whole nation of Poland was simply shifted westward, to provide more land for the USSR as well as move the frontier much further west; and East Prussia is to this day shown as “Russia” on the map, although not contiguous with any part of mainland Russia. After the land was stolen, the Germans in those regions that had not already been massacred by the Red Army were summarily shipped to the western territory. House by house, young polish thugs wearing armbands knocked on the door and announced 15 minutes to clear out; the furniture and possessions were to be left, and the door left open; saying no meant being shot on the spot. As these lands were depopulated, Ukrainians, Poles, and Russians were moved in and assigned their new housing by the communist authorities. The territory of Germany currently recognized goes no further east than the Oder River. Der Spiegel magazine reports in the 12/30/06 issue that a group of Germans is suing in the EU court for recovery of the losses on the grounds of human rights. It will probably be thrown out by the cryptocracy. But it shows that the pain doesn’t just go away. Here is a whirlwind overview of some of the points of interest within that part of eastern Germany not labeled “Poland” or “Russia” on the current maps. In a future post, I will backfill additional points of interest. This is the historical seat of the king of Prussia, then of Germany as a whole when it was unified by Bismarck. The government moved to Bonn after WW2, until the fall of the iron curtain; recently, Berlin has been reestablished as the capital. 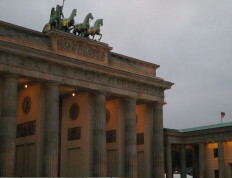 Berlin is in the center of the state of Brandenburg, but is set up as a separate city-state. Probably no further introduction is needed. This was a “mark” or buffer zone originally. The eastern portion has been the historical staging ground for the fall of three empires, a tour guide explained. The Goths and Vandals assembled here prior to migrating south and sacking Rome. Likewise, Napoleon before his debacle in Russia. Then again, this was the place for the “last stand” of the Third Reich before being swept away by the Red Army in 1945. The latter was the battle of Seelow Heights, and this topographical feature can be explored nicely. The region is full of small towns, farms, and a country-side of gentle beauty, encompassing woods, meadows, flatlands and hills (even a section they call the “Markish Switzerland”), battlefields, and castles. 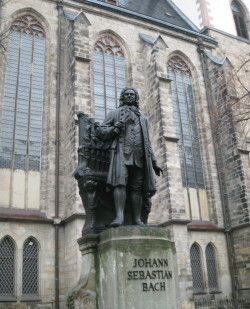 This was the final career stop of Johann Sebastian Bach. It was a prosperous city and a center of Lutheran orthodoxy. Later, the city was taken by Charles 12 of Sweden in 1706. Eventually, it became the place of Napoleon’s 1813 defeat at the hand of a German-Russian coalition. A bit to the west of Leipzig. A lot more on this later, but suffice it to say that it was the center of the pietist movement. Francke’s Stiftungen can still be visited. There is a church where Luther preached several times. In the Thuringen State, this was the favorite home of Goethe. While Leipzig was the scene of Napoleon’s surprising defeat a few years later, in 1806 Jena was the launching point for one of his great victories, and in fact the Holy Roman Empire ceased to exist because of it. Schiller spent a number of years here, and later, the great logician Frege. This became the main city of Saxony and was converted into an art city in the early 18th century by Augustus the Strong. “Art city” can be taken in two senses, both correct: the city was loaded with museums of various kinds; and the architecture was so resplendent that the city itself could be taken as a work of art. Indeed, great painters have treated it as a subject to be rendered, especially the Frauenkirche. This city has lots of important history. Originally a Hansestadt, it was visited by Melancthon and later “visited” by Gustav Adolphus. The great Elector set up a reformed faculty at the university. Unfortunately, there is precious little left of beauty. It is like C. S. Lewis’ Grey City, with only a few pleasant surprises tucked in amongst the colorless boxes. I take it to be the perfect communist city, and in fact the main drag is still called Karl Marx Strasse. However, Bomber Harris must take the first blame for what this city has become, as he must for much else. You cannot fly non-stop from America into east Germany, even Berlin. DO NOT MAKE YOUR CONNECTION THROUGH FRANKFURT AM MAIN! This required an additional security process not just once but twice more, the first entailing waiting in line for over an hour on a staircase. The staff were sullen and peevish. My return path went through Munich, and it was pleasant in every way. At this time of year, I was able to rent a low-end BMW for about $30 per day. Try to have a credit card that covers accidents, as you don’t want to be uninsured and declining the collision damage waiver might add 25 or 30 dollars per day. There are lots of hiking opportunities. Bring comfy walking shoes as well as one pair of presentable ones. Opera, concert, and theatre tickets can be ordered on line prior to your trip, so that there is no danger of being sold out. Opera is significantly less costly than the NY Met. Coffee often costs more than beer! A little cup of weak coffee might easily cost more than a Venti at Starbucks here, and don’t expect a free refill! On the other hand, in the evening, I found I could often get a nice beef-based dish accompanied by three pints of beer for around 15, which is significantly less than I expect to pay near home. The beer is so pure, you never get a headache from it. It’s almost medicinal. This entry was posted in Travelogue and tagged Germany by TJH. Bookmark the permalink. Interesting. You seem to like Germany. Why? uh… the cute coocoo clocks? I hope to visit to Germany & Poland someday since my family is from Pomerania. How to you plan your trip? Did you get anywhere near Kamien Pomorski, the northern part of Poland near the sea? Mindy — Yes… Pomerania is one of the German territories currently under Polish control. I went to the border at a couple places but did not cross over. In a future trip, I hope to venture into that region, and then I will be able to advise better how to manage in Polish-occupied territory. As far as trip-planning in general, I’m no expert, but I’ll pass on my own technique which has worked well at least for me. 0. If you don’t have the passport yet, apply for it right away. It lasts 10 years, so don’t risk waiting too long and not being able to start a trip as planned because it hasn’t come yet. 1. Decide in advance what kind of things you want to see or do: art? historical places? cities, villages, or countriside? Then throughout the years, write down places and what is interesting about it in a computer file as you discover them through ordinary reading of your books, magazines, and internet surfing. If you are going to want to go to concerts, opera, or theatre, start surfing to some of the web pages and study the schedule of upcoming productions. 2. If your list is going to include a big city, then buy one of the tour guides for that city at Barnes and Noble, and start perusing it for additional ideas of interest. 3. As the time approaches to buy airline tickets, print out a google-map spanning the places you have selected, and start to work out the path to follow to get as much as possible as efficiently as possible. 4. Reserve accomodations for the first and last night in advance. Additional reservations may be done, especially if you are worried about availability due to time or place. However, allow at least a few nights here and there to not be reserved so you can adjust your itinary on the fly. 5. Renting a car opens up lots of possibilities, especially for visiting the hinterlands. If you are going to spend all the time in just a few cities, then the railroad might be a better choice. Scottish Hammer has posted some very nice pix from Wittenberg (which I missed altogether on my trip) and Berlin (which I will be reviewing soon, but my sites are quite different from Scottish Hammer’s).